This month Beautybox from Look Fantastic has the theme ”Indulge Me” and packaging is always so beautiful, this monthly box in creamy pink color with rose gold.. just love it! Indulge Me Beauty Box! 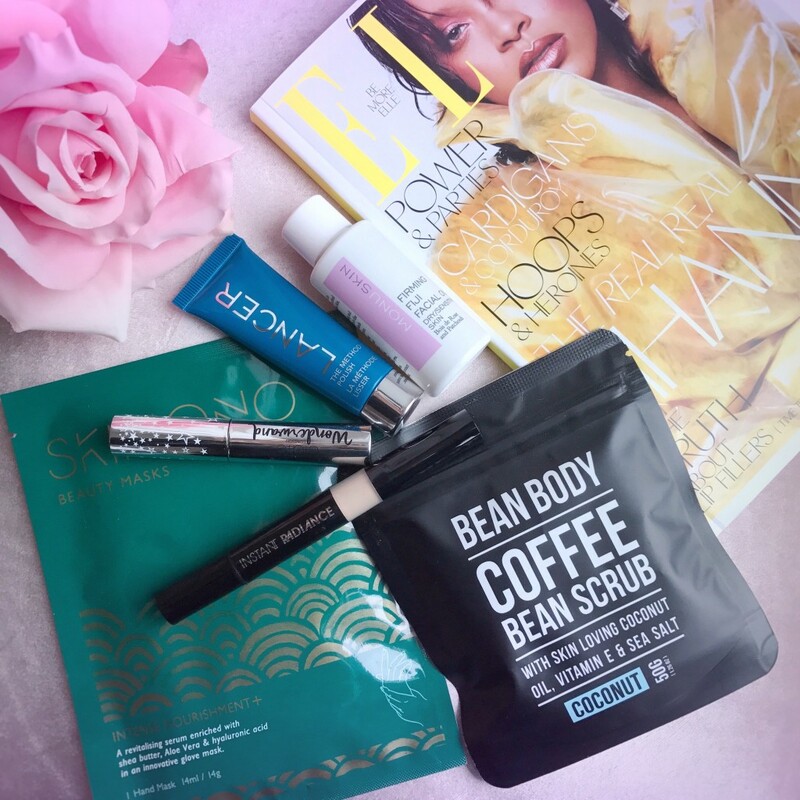 This month’s #LFBEAUTYBOX is filled with indulgent products guaranteed to leave you feeling refreshed, revived and revitalized! Plan your perfect pamper evening and find everything you need to help you relax and unwind inside this box. A copy of October Elle magazine worth £4.30, this is one of my absolutely favorite magazine. Modelco – Instant radiance concealer. This illuminating concealer is specially made for look fantastic and you can’t find it anywhere else. the creamy and long wearing formula glides on smoothly and leaving your skin looking brighter and even more radiant whilst concealing imperfections. It has a little oxidation, that i good to keep in mind. Bean and Body – Coffee bean and coconut body scrub. Yes this I am eager to try. A cruelty, vegan and parabenfree body scrub. Utilising Robusta Coffee Beans, the gentle body scrub stimulates blood flow to minimise the appearance of cellulite and stretch marks, whilst Organic Cacao and Vitamin E provide antioxidant protection to repair and restore skin. Ideal for eczema and psoriasis, its blend of Himalayan Pink Rock Salt and Demerara Sugar buff away dead skin cells, helping to eliminate blackheads and breakouts for a smoother, more refined finish. Scrub large handful of this product all over your body, leave it to dry for 5 minutes and then rinse. Your skin will be left soft, hydrated and super smooth. Monu skin – Firming Fiji facial oil. This oil was just heavenly, it has a lightweight formula and the scent was amazing. A soothing facial oil formulated to smooth and comfort the skin whilst preventing dehydration. A refreshing blend of Bois de Rose and Patchouli Essential Oils will ensure skin feels calm, firm and visibly radiant whilst added Natural Plant Oils pamper pores and stimulate the complexion. Warm up a small amount between your palms and dab it on your face. Skimono – Hand mask. I often forget to take care of my poor hands so this handmask was very welcome. Inspired by Asian beauty trends these hand masks are made to intensively nourish those hard working hand of yours. A revitalising serum enriched with shea butter, Aloe Vera & hyaluronic acid in an innovative glove mask. Lancer – the method polish. This fresh face polish has a wonderful spa-scent and feels so fresh and effective. I love it! It’s Victoria Beckham’s go-to product – this means it’s good for one.This daily use skin polish is a skin resurfacing treatment and the 1st step in The Lancer Method. Formulated with a two-pronged approach to exfoliation, this unique polish includes pure minerals and Pumpkin and Pomegranate enzymes to gently and effectively remove surface debris and dull, dry surface cells. A warming element and Lavender scent complete this luxurious daily ritual. Ciaté – Wonderwand mascara. This mascara is a bestseller from their brand so I am happy to try it out. Mascara is hard to review because we have so different eyes and eyelashes so if one suits me perfect it’s not certain that it is the perfect match for you. You have to keep trying until you find the perfect match for you. This mascara is suppose to give intensely volumising and lengthening fearless lashes. The formula is paragon free and vegan friendly.